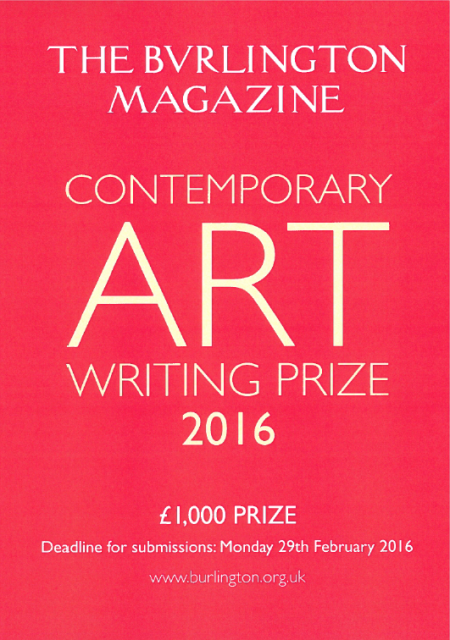 The Burlington Magazine is now accepting entries for the Contemporary Art Writing Prize 2018, and am writing to ask whether it would be possible to distribute the call for entries to your students. The aim of the Prize is to discover and encourage emerging young writers on contemporary art, with the winner receiving £1,000 and the opportunity to publish a review of a contemporary art exhibition in the Magazine. Our guest judges are the former Director of Camden Arts Centre, Jenni Lomax and the artist Fiona Banner. The deadline for submissions is Monday 26 February 2018. Previous winners have included both undergraduate and postgraduate students (age cap is 35 years old), and all have gone on to work in the arts, continuing to write for the Magazine and holding significant curatorial positions at institutions such as Tate Modern and the Barbican in London. Please find attached for further information.